Mommies, I’m sure you’ve heard about health warning issued by the Food and Drug Administration (FDA) on imported fruit juice, soft drinks, sport drinks and jellies due to contamination. The imported beverages, which have yet to be named by Taiwanese FDA, were said to contain an ingredient not fit for human consumption. Instead of palm oil, the product is mixed with dangerous chemical being used to manufacture plastic. This is scary for us consumers, especially for us mommies, right? Kids just love to drink instant and colorful fruit juices. I couldn’t bear the thought that I (unknowingly) could have exposed my kids to contaminated products, which are supposed to pass rigorous food-safety standards . Widely used as a plasticizer in the manufacturing of articles such as intravenous bags and tubings, blood bags and infusion tubings and nasogastric tubes, DEHP was found to be illegally added to a food product raw material intended for emulsification. While low doses of DEHP are generally safe, high doses or prolonged exposure can have harmful effects. Children are especially prone to the harmful effects of high doses of DEHP or to repeated exposure which can lead to testicular effects, fertility problems and toxicity to kidneys. – Department of Health explains chemical found in Taiwan juices and jellies. Even if my family is protected by a high risk life insurance, this doesn’t mean I can sit and relax here without doing anything about this scary news. As consumers, we should be vigilant about the food that we purchase from the market. Update ourselves with the latest news that concerns food safety. Regularly check out for products that carry labels that might have been banned or removed from market shelves. This entry was posted in Health Advisory and tagged banned food from Taiwan, banned imported food, contaminated food, contaminated food from Taiwan, contaminated fruit juices from Taiwan, food safety, imported food ban, Taiwan food on May 31, 2011 by Yami. I’ve learned something from a friend today. She said she treats common cold and flu by using a holistic approach. Her secret, well not a secret where to buy gold bullion, but a simple remedy that includes gargling with hydrogen peroxide. I haven’t tried this one yet. In addition to her supplements, she takes vitamin D. Vitamin D is effective in protecting people against flu (swine flu) and other illnesses. And the common remedy that we know: take plenty of water, wash your hand frequently, and take plenty of rest. Can you share more health tips to the list? This entry was posted in Health, Medicine and tagged common cold treatment, gargle with hydrogen peroxide, simple remedy to cure common colds and flu, vitamin D, water intake on May 27, 2011 by Yami. I’m sharing with you this brief list of infections that are existing, recurring or has the potential to cause an outbreak. There are non-infectious diseases on the list but, still may cause an epidemic. I wrote this for People’s Tonight. My source was the ever friendly Dr. Eric Tayag, who was the head of the National Epidemiology Center (NEC) of the DOH. He is now serving as Assistant Secretary of the DOH. I hope you will find this information useful. The Philippines remain under treat for this global pandemic. While we are waiting for the elusive vaccine to treat the virus, experts recommend proper personal hygiene and increase body resistance. The National Avian Influenza Task Force remains vigilant of the possible entry of the avian influenza in the Philippine shore. In previous years, the mosquito-borne disease usually peaks during the colder months, but now cases have been reported at any given time of the year. To avert food poisoning, Dr. Tayag recommends consuming food from reputable sources and as much as possible cook the food properly. Symptoms can vary depending on the cause of the illness, but the classic signs of stomach flu are combination of diarrhea, fever and vomitting. A serious disease caused by a virus that attacks the liver. It can cause a lifelong infection, cirrhosis (scarring) of the liver, liver cancer, liver failure, and death. Health experts are concerned about the hidden epidemic of injury cases. Although it’s not infectious it can cause deaths. Scientists say the deadly birdflu virus is mutating steadily and may eventually acquire the changes it needs to be easily transmitted from human to human. Infected rodents and other wild and domestic animals pass the bacteria in their urine. The bacteria can live for a long time in fresh water, damp soil, vegetation, and mud. Flooding after heavy rainfall helps spread the bacteria in the environment. Measles, also called rubeola, is a highly contagious – but rare – respiratory infection that is caused by a virus. It causes a total-body skin rash and flu-like symptoms, including a fever, cough, and runny nose. The problems of controlling malaria are aggravated by inadequate health structures and poor socioeconomic conditions. The situation has become even more complex over the last few years with the increase in resistance to the drugs normally used to combat the parasite that causes the disease. The DOH still expects sporadic cases of meningococcemia in different parts of the country, but health authorities assured that current distribution of cases do not pose any serious outbreak. Meningococcemia is an acute (sudden onset) infection of the bloodstream and developing vasculitis (inflammation of the blood vessels) caused by the bacteria Neisseria meningitidis. 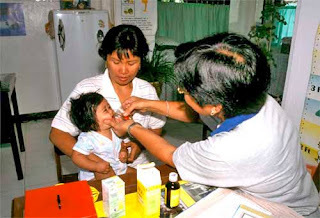 Neonatal (newborn) tetanus is the most common form of tetanus in developing countries. The disease is caused by contamination of the umbilical stump with spores following childbirth through cutting the cord with an on-sterile instrument or by application of animal dung to the cut cord. The incident of mercury exposure of students and faculties of St. Andrew’s School in Paranaque a few years ago has heightened public awareness on environmental poisoning. Rabies is acquired from virus in saliva entering a bite wound caused by an infected animal, usually a rabid dog. The severity of the bite determines the risk of infection. The disease does not usually spread from man to man. He said women should be careful because they are the last to know that they have STDs unlike the male population whose symptoms are florid or obvious. Some women patients may have ectopic pregnancy only to find out they are infected with STD. This is related to cholera and gastroenteritis in terms of breakdown of hygiene, sanitation and availability of clean potable water. In relation to influenza pandemic, cases of upper respiratory tract infection may increase during the rainy months. URTI is a nonspecific term used to describe acute infections involving the nose, paranasal sinuses, pharynx, larynx, trachea, and bronchi. An example is the illness known as the common cold. This entry was posted in Diseases, Health, Safety and tagged diseases that may cause an outbreak, existing diseases, infectious, infectious diseases, outbreak, recurring infection, tetanus infection, trenda of infectious diseases in the Philippines on May 26, 2011 by Yami.